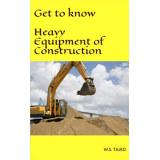 Get to know Heavy Equipment of Construction. From excavators to dozers, skid steer to loaders, from cranes to trucks, and much much more. Big clear pictures and small illustration that also explain what these machines do! Your kid is sure to enjoy this picture book. For all ages fun and learning.